Located in the "Oriente" (East) of Ecuador, it is one of the few protected areas in the world, located precisely on the equator. 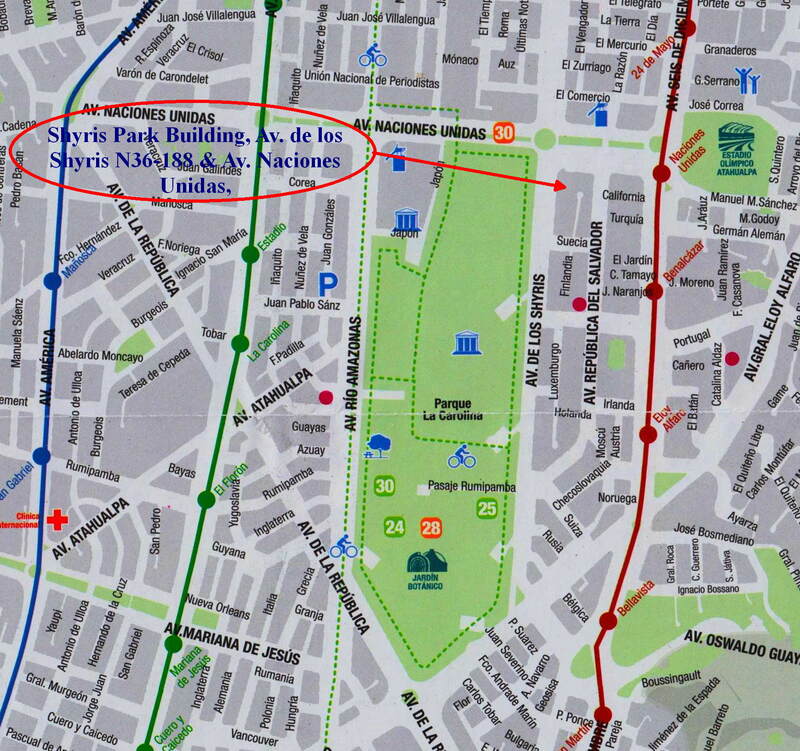 It takes only half an hour to fly from the capital Quito to the town of Lago Agrio, the port of entry into the Amazon Region, and from there an hour and a half over an asphalt road to the park. 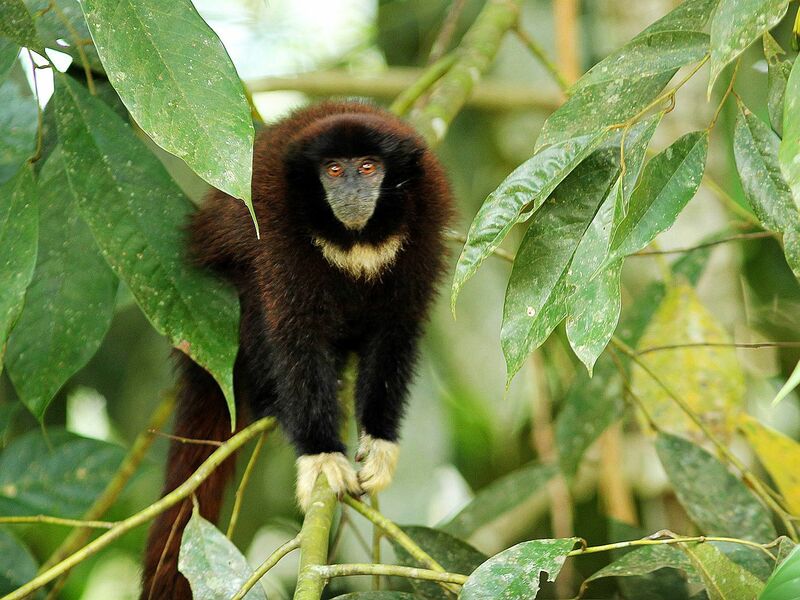 No other Amazon park in the world has such convenient and fast access! 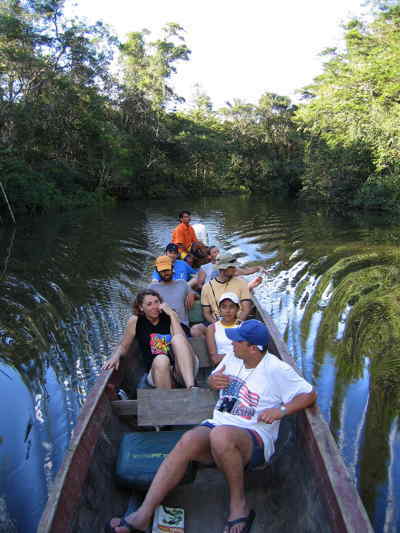 Just for that, Cuyabeno is known to be the most convenient park for an Amazon Rainforest Lodge Tour. Lastly, in a motorized canoe, one may move about more rapidly between the best wildlife spotting sites than on foot, while watching birds as the scenery glides by quietly. These factors combined make Cuyabeno National Reserve Ecuador one of the best, if not the best Amazon Park in the world, where one can see more different species of animals and flowers per day than in any other Amazon park. As bird and wildlife observation is best very early in the morning, it is paramount to be right in the heart of the best place for observing animals. In the Cuyabeno, this is the Cuyabeno Lake system. 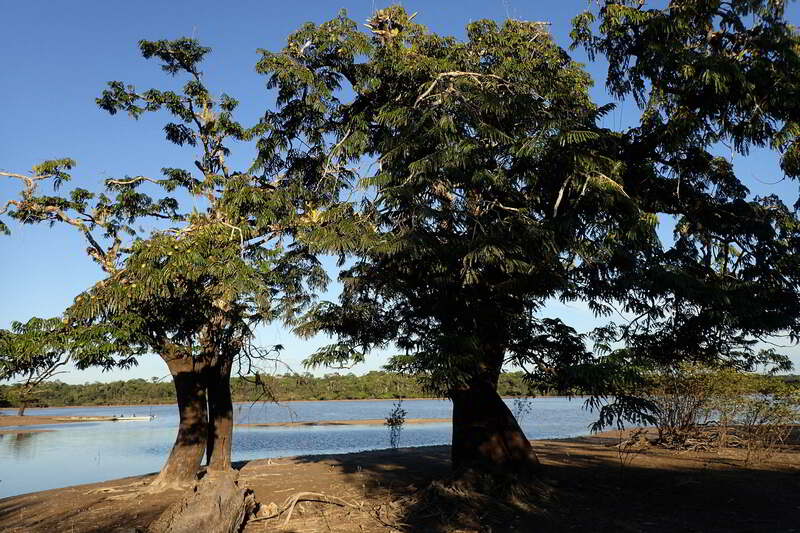 The Cuyabeno Lodge is on a seasonal island, right in the heart of the lake system, while visitors coming from most other lodges must first travel 30 to 45 minutes to get to the lake. 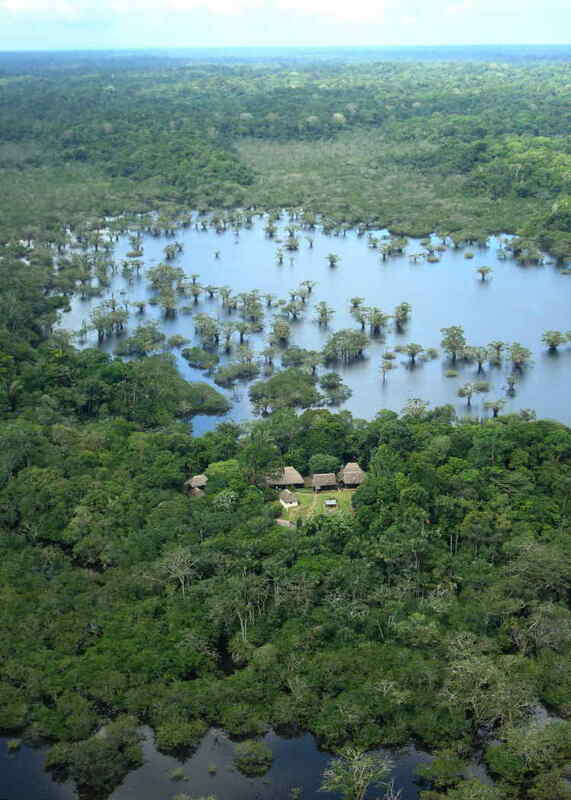 According to Tripadvisor, our Cuyabeno Lodge is the best Amazon Rainforest lodge in Ecuador! 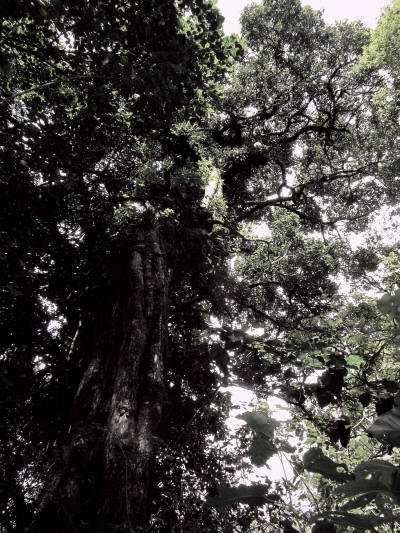 Visibility on the ground within the Amazon forests is poor, making exploring the Amazon rainforest more difficult as one is blinded looking up while having to permanently having to watch where one walks. This makes wildlife observation much more difficult. Watching birds, flowers and mammals from narrow rivers is better as trees along the creeks are lower and the sunlight penetrates to illuminate the river banks. 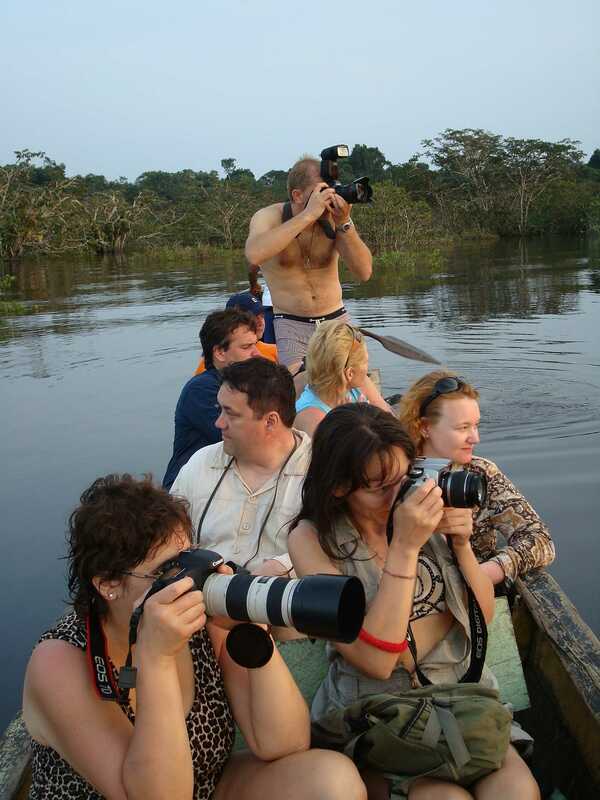 Moreover, wildlife observation and photography from the water is much more convenient and effective, as one always has his/her binoculars, camera and birdbook at hand, as opposed to when one is walking through the forest. 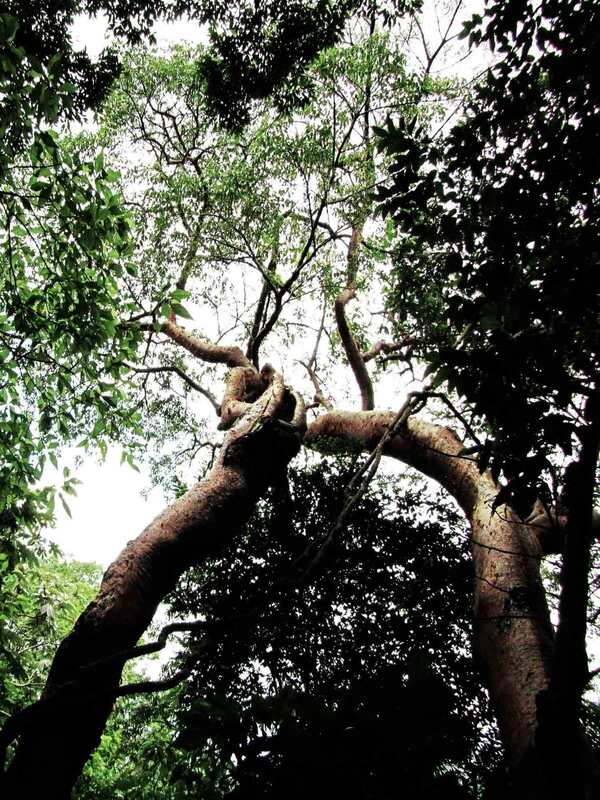 The beauty of the Amazon jungle is in the small details. 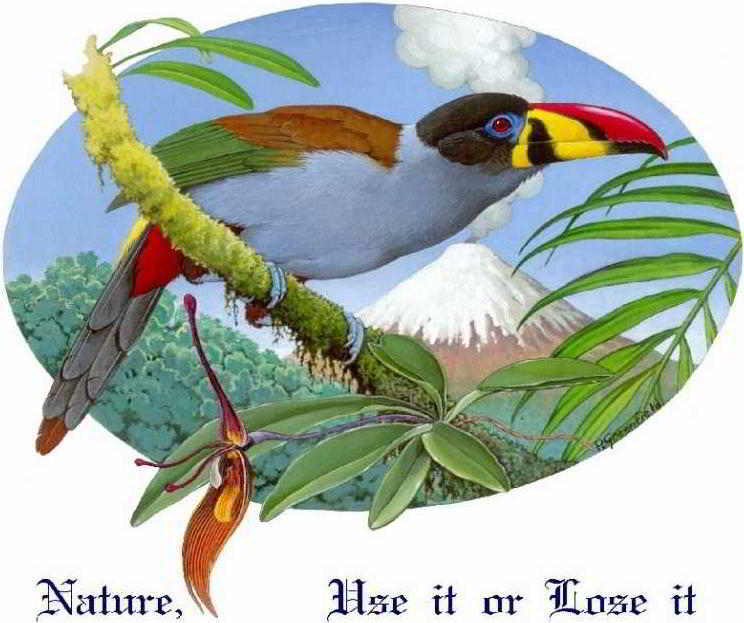 There are up to 580 species of birds, many of them incredibly beautiful, while flowers, such as orchids and bromeliads decorate the forest. With or About 450 long and 150 km wide, the park covers according to the latest data of the Ministry of Environment 590,112 hectares (5,901 km2 or 2,330 square miles) of mostly pristine Amazon jungle as you can see on Google Earth above. 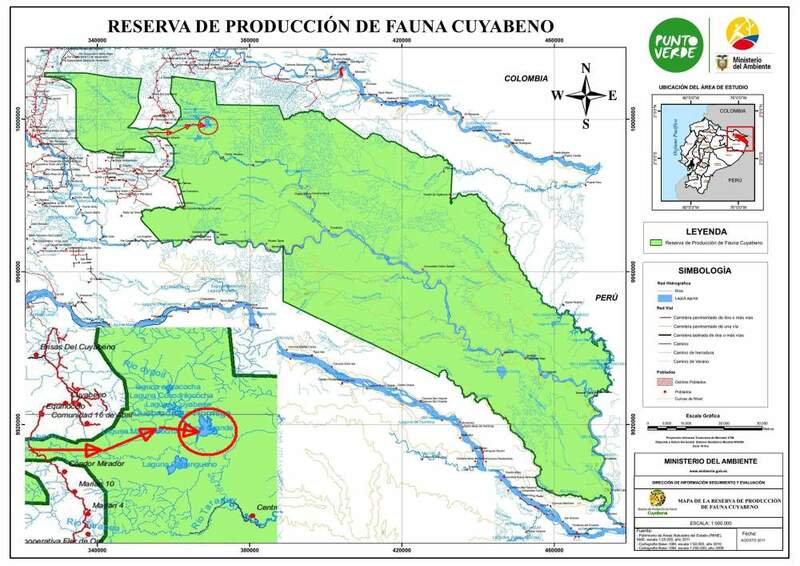 The Reserve incorporates most of the Rio Cuyabeno watershed which drains into the Aguarico River; About 60 km down stream, along the Río Aguarico, is the Zancudo Cocha Lake and further down stream are the Lagarto Cocha Lakes along the border with Peru. At a gradually sloping elevation form 300 in the East and 200 m at the border with Peru, the Reserve is covered with humid tropical rainforest. 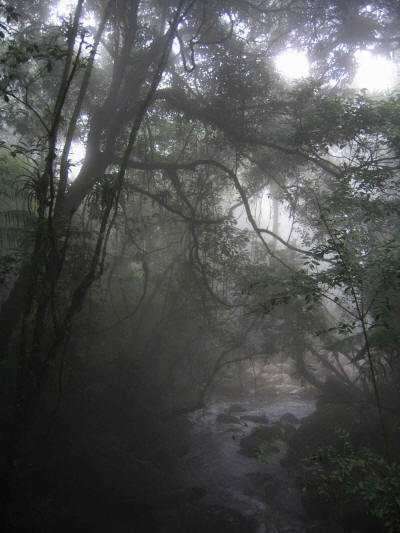 As weather stations are rare in the this part of Ecuador, the climate data are merely indicative; the precipitation is around of 3,400mm of rainfall per year. While rain showers occur any time of the year, a somewhat drier period ranges from Mid December through the first weeks of March. During this period, the narrower rivers and some of the lakes may fall dry in some years. 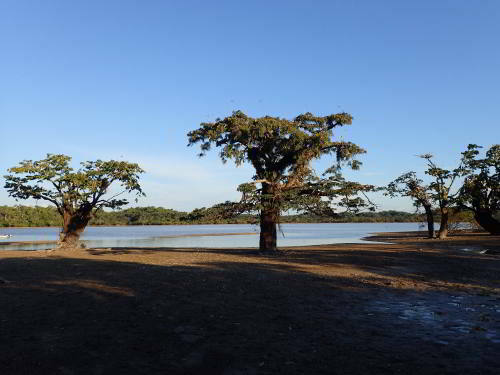 The dry season is interesting, as wildlife often congregates around the the remaining pools of the drained lakes. For many birds, the dry season is the breeding season, while it also coincides with the Northern winter, the period that many Northern migrants visit the area. permanent lakes that always keep a permanent water body are rare, (Zancudo Coche along the Rio Aguarico). 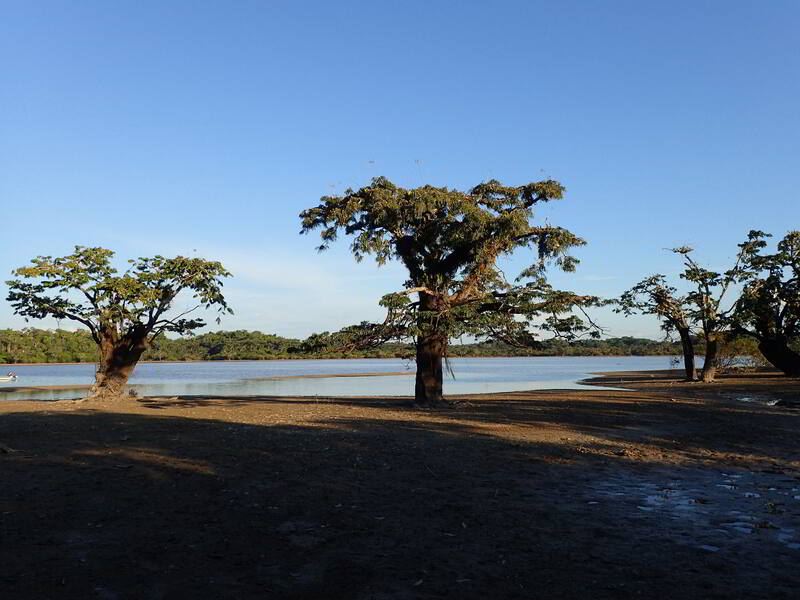 The lakes are black-water ecosystems; however, when the black-water rivers are laden with sediments during high rainfall, the lakes too may become sediment laden and may become lighter to a "coffee with milk" color. 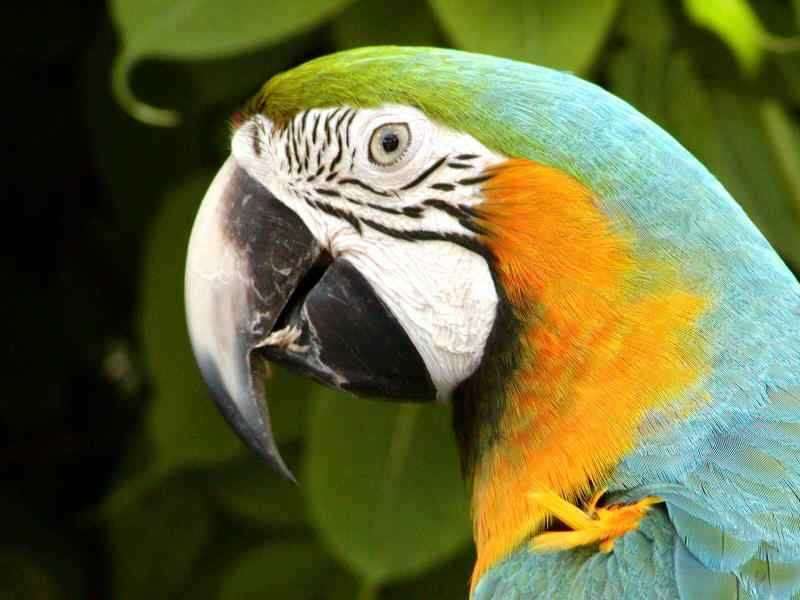 Birds are the jewels of the tropical jungle and with a bird list of up to 580 species, Cuyabeno is rising to one of the world's hot spots for birding. 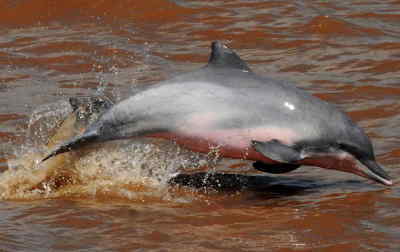 There are also a great number of mammals native to the Cuyabeno Faunistic Reserve, which include dolphins, manatee, at least 10 species of monkeys, including the night monkey, which was first recorded for the reserve by our staff, different species of both insectivorous and fruit-eating bats, many rodents, varying from the world's largest one, the Capybara to many mall ground and tree bound creatures. 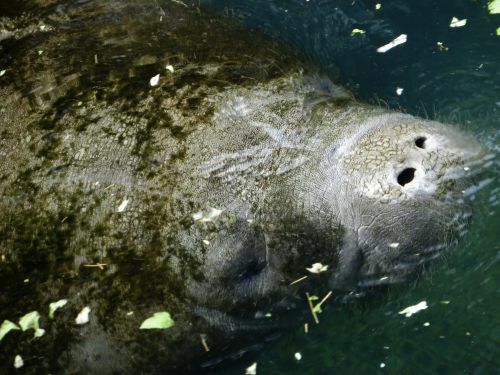 Ungulates are represented by tapirs, two species of peccary and several species of deer. And of course there are the Sloths, Ant Eaters and a good number of the South American cats, including jaguar and Puma. While we say that we go birdwatching, of course we keep an eye out for all animals. 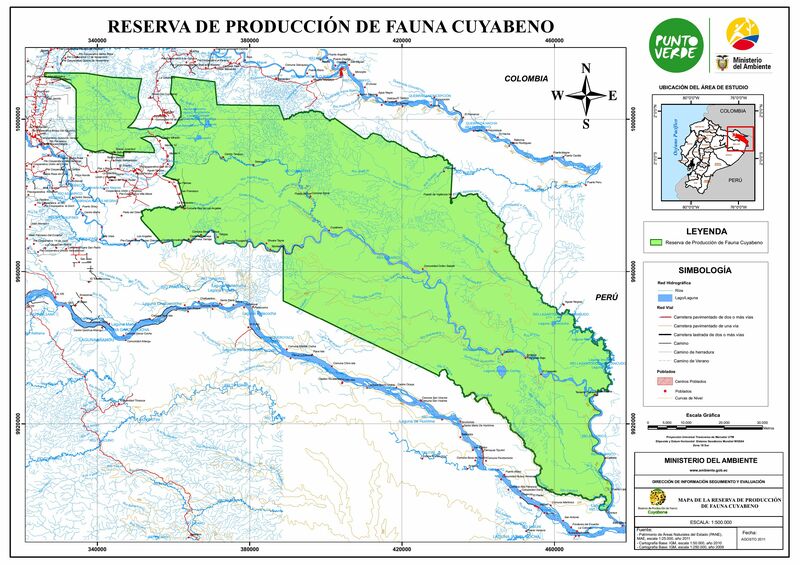 When the FAO national parks team selected the Amazonian protected areas of Ecuador in 1975, Cuyabeno was known for its enormous Boa Constrictors (terrestrial, usually up to 3 m, but occasionally reaching 4 m), Anacondas (water-loving, up to 6 m Anacondas are frequently seen, occasionally reaching 9 m). The good news: It still is. Giant anacondas are seen relatively frequently, sometimes with a characteristic swelling: the remains of a peccary or capybara. Some of the water turtles are larger than half a meter, while in the hilly areas, some of the land tortoises grow to up to a meter. Smaller reptiles include many species of snakes and lizards and several species of iguanas. At night geckos hunt insects around the lights, while in daytime one occasionally finds Iguanas and many turtles on logs in the rivers. Amphibians are omnipresent, but most of them are very hard to spot, and often one must be satisfied with their orchestras that last throughout the night. The diversity of tropical fish of Cuyabeno is extremely rich and includes the infamous piranhas, giant catfish, electrical eels and countless little tropical species. 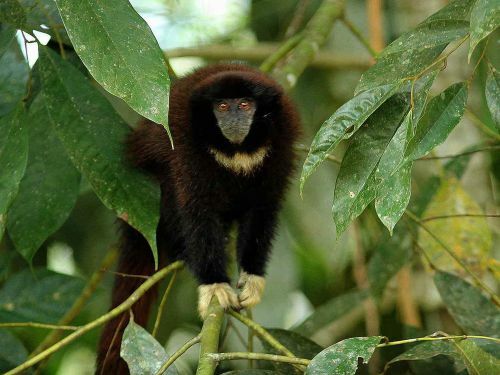 A primate study in the reserve, revealed that of the 19 species of primates living in Ecuador, 10 species have been reported in the Cuyabeno Wildlife Reserve. The Cuyabeno Lakes are frequented by both species of Amazon Dolphins and less frequently Amazon Manatee . Our Cuyabeno Lodge, is the best Amazon Jungle Lodge located in the Reserve. 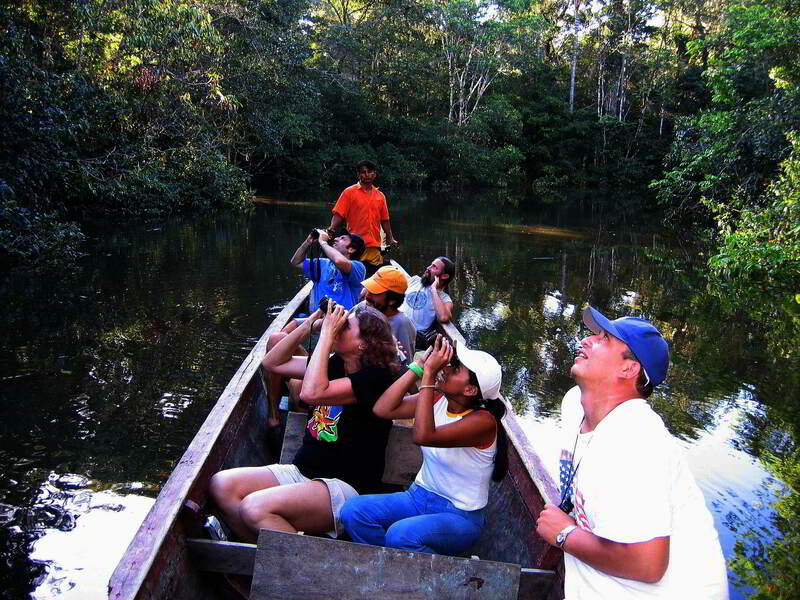 Our programs are widely known for the knowledge of our guides about birds as well as other Amazon Jungle Animals and Amazon Rainforest Plants. 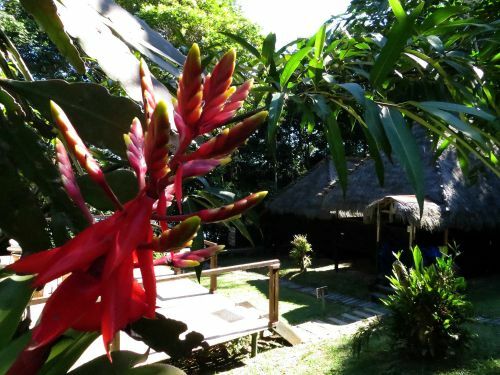 Check our Cuyabeno Lodge rates. 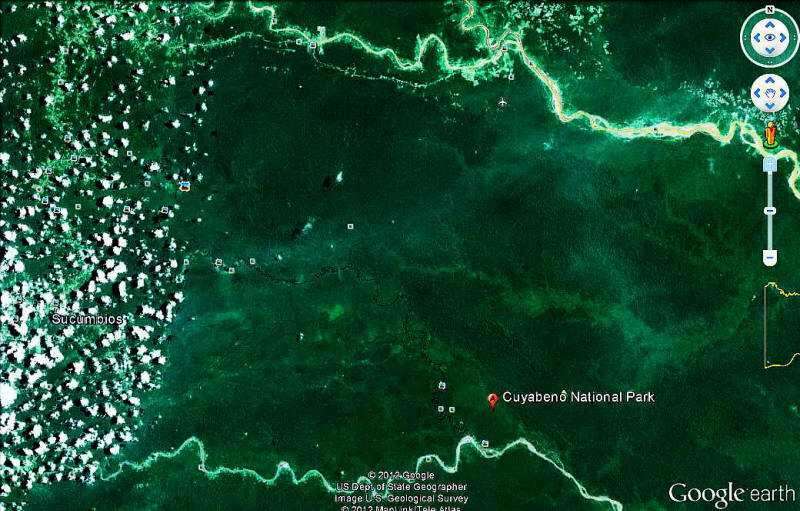 Cuyabeno Wildlife Reserve with the Cuyabeno Lodge from the air.